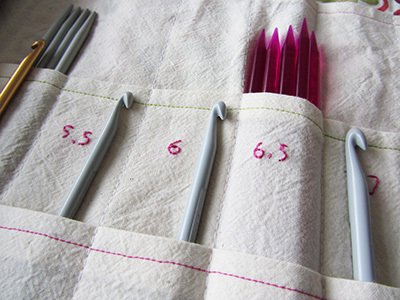 Straight needles and crochet hooks: organised! Promise kept: after organising my circular needles, I handled the straight needles and crochet hooks with some maestria I have to say. 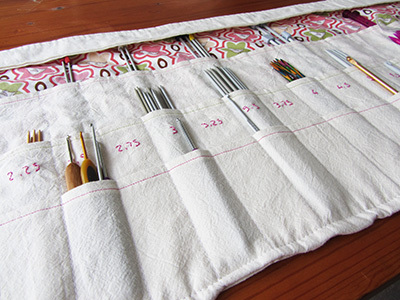 I wanted an organiser to carry at the same time my regular needles, double pointed needles and crochet hooks. It would also need to have room for any addition to my collection. The organiser I made caters for 1.75 to 10 mm needles. Smaller hooks and larger knitting needles will be kept somewhere else as I am less likely to use them. 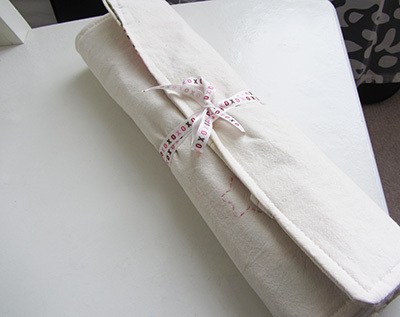 So I layered three pieces of cotton on a lovely print fabric and divided them into 20 compartments. There is a flap at the top to prevent needles from going away. The outer is made of the same plain cotton with some embroidered details which are shapes taken from the print pattern and enlarged (birds and flowers). The organiser closes by rolling it and tying ribbons. 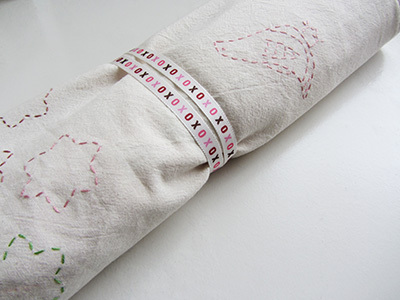 Print colours are used as accents for the inner stitches and size numbers. 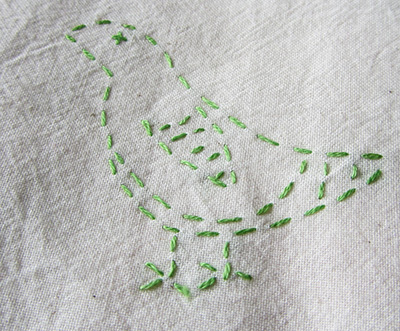 By the way the numbers are hand embroidered, the idea was to mimic hand writing and it worked pretty well. I am particularly proud of my 6, don’t you like it? This is a giant step in my knitting gear organisation. I have some bits and bobs left that will soon move in a lovely card box: tapestry needles, spare tape measure, stitch holders, etc. There is still a painful issue to address: yarn. I prefer not to think about it right now, this really is a painful one (for me and for people sleeping in my bedroom, ahem). This looks beautiful. You have made a really good job on this – truly individual and something to treasure.